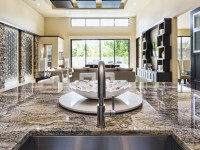 Granite, marble, travertine, and other natural stone countertops can take a beating. Kitchen countertops are in the heart of the home, a place where friends and family gather, meals are prepared, everyday cooking and clean up. Countertops play a major role in just about anything you do in the kitchen. Marble countertops, vanity tops and other surfaces can become etched from using the wrong cleaners and spills from acidic liquids like orange juice, vinegar or wine. Despite natural stone's durability, these countertops will become dull, scratched, etched, stained or chipped. But, not to worry. The technicians at Stone Makeover are educated and trained to restore, repair and clean your marble, granite, travertine, slate, soapstone, quartzite and other natural stone countertops and floors. We can also eliminate any unsightly seams and apply a professional sealer on the surface to help inhibit any stains. At Stone Makeover, we know not all natural stones are the same and all kitchen environments vary. That’s why we train our technicians to analyze the stone and develop a plan of action before treating your particular countertops. You can be assured we use the finest products and equipment available, and guarantee our results. Watch our video to learn more about our granite countertop refinishing.